The 2019 MEGA GUIDE – Version 3 Now Available! This is your one-stop shop this pre-season for NRL SuperCoach. We have absolutely everything covered in here and you’d want to hope so given that is over 68,800 words and 136 pages long! If you’ve purchased this already you should have already received an update via email. Don’t forget that we will be donating 10% of all Mega Guide proceeds to the Townsville Flood Relief. As it’s an electronic document, we will update the document there are any significant events or omissions. We are a week behind our planned deadline due to updating the guide as a result of the Ben Barba sacking. 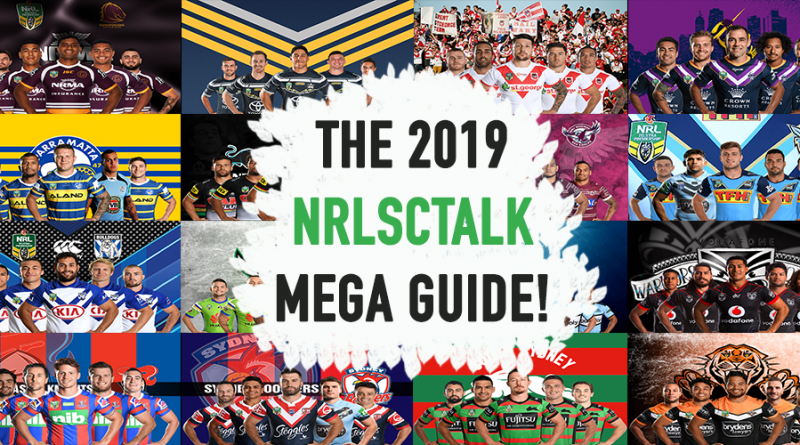 We are planning to release another two versions of this Mega Guide before the start of the season that will reflect any significant changes or news updates throughout the pre-season. Once you have paid for the guide you can access updates when they are released. Wenin, Nick, Wilfred, Daniel (aka Semisonic) and Justin (aka. JT). That’s a past Overall Champion, a top 250 finisher and multiple top 500 and 1000 finishes from the rest. Our blood, sweat, and tears have gone into this over a few grueling months of pre-season. $12.99 – which is less than the cost of a large popcorn at date night or a pint of craft beer. You know you deserve this….. Attached is a copy of our 2017 Mega Guide for you to have a look through in order to get a sense for what you are paying for. Lastly, we’d really, really, really, really appreciate it if you didn’t share the document once purchased. Not only have we put a crazy amount of hours preparing this, but it’s also stealing. So please don’t do that and support the site. It’s frankly great value for the amount of content you get. Thank you in advance! Hey guys, just reading the Guide again and again – it’s great! Have also listened to your podcast and have changed team around again and again! Ah it’s all worth it though, don’t you reckon? Congrats on doing such a good job. Hey Nick, you mentioned that you also had a Sunday evening podcast – how do we catch it? Has it started already? Well anyway, just to let you blokes know that you’ve done an amazing job. Thanks for all the tips and insights! Cheerio! Could you tell me when the final draft will be released? I’m guessing there wouldnt be too much additional information that would still need to be added. Cheers! Hi mate – it will be released today! There are a lot of updates! Cheers mate, I will order one tomorow. Hi, I purchased the original mega guide but have not received an update version. Could you please re-send to me please ? I purchased the MegaGuide yesterday around 1pm. How long does it usually take to get delivered? Cheers! Hey guys – love the guide! Thanks heaps for doing all of the ground work for us lazy bastards. Can’t find any info on Corey Oates in it though. just an oversight?